A daily fitness regime is important in keeping your body healthy. But is your scalp's health at risk? Perspiration and greasiness after a good work out can result in dandruff-prone scalp. Now, you can bid a definite farewell to your dandruff with regular use of New Pure Derm Anti Dandruff Shampoo - the Dermats# recommended solution for recurring dandruff**! Infused with Menthol, along with Oxy-fused Micro Bubble Technology, New Pure Derm Mint Cool Shampoo purifies* your scalp deeply and helps to get rid of grime and grease build up on your hair, providing an intense cooling sensation with long lasting freshness. The patented technology assures you of removing upto 100% dandruff from your scalp and preventing it from returning*. op more Pure Derm products here. 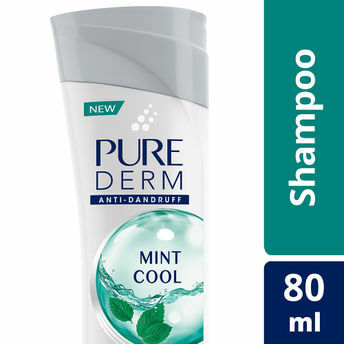 Alternatively, you can also find many more products from the Pure Derm Mint Cool Shampoo range. Explore the entire range of Shampoo available on Nykaa. Shop more Pure Derm products here.You can browse through the complete world of Pure Derm Shampoo .Alternatively, you can also find many more products from the Pure Derm Mint Cool Anti - Dandruff Shampoo range.